The LocalKidFun.com blog is written by a mother of two living in Metro Atlanta, Georgia who blogs about activities for kids, places to go, fun, sports, camps, family life, and more. Gail Mirabella entertains audiences of all ages with her fast paced and fun act, “Dynamo Flying Dogs”. She is currently touring with the Ringling Bros. and Barnum & Bailey Circus. The circus will be appearing from February 13th through 22nd at Phillips Arena in Atlanta. In 2005, Gail – who had also worked full time for many years in the pharmaceutical industry – decided to leave her “day job” to focus on her dogs and her love of everything having to do with them. In addition to her many public appearances, she has been much in demand to teach courses in agility, obedience, disc and flyball. Gail Mirabella has garnered regional titles in canine disc competitions throughout the United States, and has won the right to attend several world finals and founded the New England based Yankee Flyers Dog and Disc Club, of which she remains president. 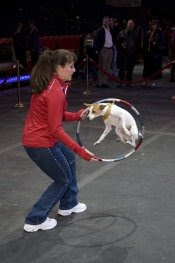 Gail was a member of the Purina® Incredible Dog Team for five years, traveling the country sharing her expertise, giving demonstrations and entertaining crowds at sporting events, festivals and fairs as well as on television’s Today Show, Tonight Show and Late Night with David Letterman. Candace Robichaux, owner of LocalKidFun.com had the chance to talk with Gail recently. Surrounded by her 12 dogs, many of whom she rescued from shelters, Gail spoke candidly about how she made the leap to working with her dogs full-time, tips on travelling with dogs, why dogs are important for kids and some quick training tips you can use at home. Q: A few years ago you left your corporate job to pursue your passion for your dogs full-time. What made you finally decide to leave the security of your job and go join the circus? A: I had been doing agility training and working dogs for a long time on a part-time basis. I’m always stressed about leaving my dogs when I have to go to out for a short time. I wonder what they are up to. When my mom passed away 10 years ago, I realized that life is too short to be stuck behind a desk all day. With the emotional support of my family, I decided to finally do what makes me happy. My family supported me because they know once I put my mind to something I get it done. At first I was planning on opening a dog training facility. I set myself up financially when I left my job and knew I could always go back to the corporate world if I had to. When you do make that leap, you will look back and ask yourself why you didn’t do it sooner. My advice to others: figure out what you are passionate about, secure yourself financially, then take the leap into doing what you love. You will never regret giving it a try. Q: You have been traveling with your dogs to many different cities on your tour with Ringling Bros. and Barnum & Bailey Circus. Can you give us some tips on traveling with pets? I am first and foremost a firm believer of safety with the dogs. I currently have 12 dogs. I purchased a large cargo van and a crate for each dog. The crates are secured to the walls of the van and to each other. I can’t stress strongly enough how important it is to secure dogs in a crate or seatbelt while in the car. I’ve had 5 friends who were in terrible car accidents with their dogs and the dogs were killed. One person had a fender bender and their dog was killed because it was on his lap and the airbag crushed it. You wouldn’t put your two year old in a car without securing them. You should do the same for your dogs. It’s not just for the dog’s safety. You wouldn’t want a 30-50 lb projectile flying forward and then back into a child that might be in the car. Also, don’t ever let your dog stick their head out the window. I was a vet tech for 7 years and can recall many animals coming in with eye injuries due to something flying into their eye or a branch slicing their eye open. Safety is number one. Q: Dogs thrive on routine. How have you managed to keep them on a schedule during your travels? My dogs still eat twice a day, at the same time every day. They get let out often. I have kennels set up in my trailer and the dogs get fed in their crates. I also set up a yard outside my trailer at each location. If it’s warm out, I leave the door to the trailer open and they can come in and out as they please. I am sitting on the couch in my trailer surrounded by dogs right now. The key to keeping the dogs happy is trust. Dogs don’t stress out if they trust their owner or handler. Also, having multiple dogs helps. They keep each other entertained. Q: Have your dogs ever disobeyed your command or made a big mistake during a performance? How did you get them back on track? A: I do agility and Frisbee in the show. It’s very high paced and high energy, if they make a mistake it’s usually a handling error. I train the dogs by the American standards of dog training - teach them basic obedience first then the tricks like Flyball, Frisbee, agility, etc. I typically use herding breeds and a couple rat terriers in the act. When they make a mistake, it’s not the dog. They are out to please you. Their reward is the fun, catching the Frisbee is the reward. Recently one of the dogs missed a Frisbee because he looked down at a carrot left by a previous act. I never have trouble getting them back on track because they love it so much. When they miss, it’s no big deal, but when they catch a Frisbee, the crowd goes wild. The dogs look like they are having a blast and they are. Q: How do you recognize what mood your dogs are in? A: I can just tell if they start looking around, their ears go down, their tails drop, etc. I may already know about something that stresses out a particular dog from practice. I have one dog who stops whenever she sees a shadow. I never get mad at them. I figure out what I can do to keep them from stressing. I build them up & build them up with positive reinforcement until they are ready. I rescued one dog who had very little human contact. She was a basket case and I took her on as sort of a project. Now she performs in front of thousands of people and the music and lights. It took a long time, but we developed a very strong bond. I make it lots of fun for the dogs and use lots of positive reinforcement, lots of treats. If they start stressing out, I back off on that trick and go back to something they feel more comfortable with. One time I put a dog out there that just wasn’t ready, but I needed him as a backup. He didn’t perform all the tricks well, but he was out there jumping around and having fun and the crowd went wild anyway. 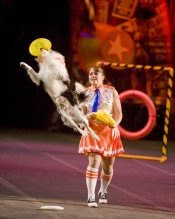 Q: Besides your dogs, what is your favorite animal or act performing in the circus? I love the elephants. They are majestic, huge and able do things that you wouldn’t imagine like sitting upright on their hind legs. A neat trick they do during the act is when a couple of elephants lay down and smaller ones slide down them. It’s a lot of fun to watch and you can tell the elephants are happy, with their ears flapping. Backstage the elephants are calm and cool and each has its own personality. They are very intelligent. Sometimes I work with the elephant handlers to try to teach one of them to catch a Frisbee. There’s one who can catch a stick with his trunk. It would be cool to someday have the elephant throw a Frisbee and a dog catch it. Q: My dog takes off every time we let her off the leash or gets out of the fenced back yard. What is your advice for handling this situation and what tips can you give other people when training their dog? A: With this problem, I would go into a fenced area and begin working with your dog on recall. If you always use the word “come”, change it to something else. I use the word “here”, it sounds a lot more pleasant and higher pitched. A dog shouldn’t come on its name. Dogs should always look at you on its name. For example, call “Jake”, when the dog looks at you then throw a treat. If the dog crosses a busy street and you call their name you don’t want them running back across the street to you. Their name should cause them to pause, look at you and wait for the next command. For your treats, use something good like a piece of turkey hot dog or cut up string cheese. All positive reinforcement is the key. Then when you’re not in the fenced in area use a flexi lead and let them roam as far as they want. Then call their name and say “here”. When they come to you give them a treat. Eventually this may teach them to stay with you and listen to your recall commands. If they do take off, the best thing you can do is run in the opposite direction. Otherwise, it becomes a game for them and they think they have the pack following them. Q: You entered your first junior dog competition when you were 10 years old. Why do you think dogs are so important to kids? A: Dogs offer a bond. I had lots of friends, but there was something special about the bond with my dog that couldn’t be replaced. It made me mature and really helped with my self-esteem through my teenage years. I was seeing a psychologist when I was young because I had very low self esteem. The psychologist actually told my parents to buy me a dog of my own instead of just the family dog. For my 14th birthday I got a wolf hybrid named Timber. He lived for 14 years and even went to college with me. I had someone to talk to and cry to, someone always with me. It gave me self-worth, something relying on your for friendship. They are always happy to see you, never make fun of you, no matter what your hair looks like or if you have ugly shoes, the dog doesn’t care. Having a pet can give kids some direction. Another option is the local 4H clubs. Some 4H clubs have competitions at agriculture or state fairs. When I was doing Frisbee shows with my dogs independently at state fairs, I loved to see the 4H competitions. There would be a young child with a chicken that he groomed and trained. The pride in the child’s face was priceless. Family Fun at Your Fingertips! Happily married mom of two. Grew up in the N. Eastern U.S. & went to college there. After college I moved south and love it here. I was a recruiter for about 10 years (mainly recruited I.T. people). Since the birth of my son in 2000, family has been my main focus although I've maintained either a PT job or some project /volunteer position that was like a job. Now, I am the owner of LocalKidFun.com, a website dedicated to putting family fun at your fingertips. The site serves families in Fayette, Henry and Coweta Counties, GA.